You can see on his face how excited he looked as he saw me marching down the aisle, hehehe. Yep, that's my hubby, Glenn, at the center. On his right side was his younger brother (who was his best man) and on his left side was his dad, my father-in-law. Pati ako napapasmile hehehe.. August din ba anniv nyo cooks? Hope to see you at mine! ;-) Thanks! the dashing groom...awaits his bride.. how sweet. visiting from WW! what a handsome groom! thanks for joining WW this week sis! 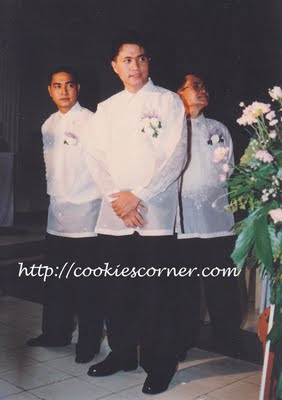 parang si prince William ano.. hahha.. dropping by Cookie for nostalgia.. see you! I agree with you cookie..the photo looks so natural. Thanks for the visit anyway.